sundars Diary: Any amateur astronomers in coimbatore? Recently i developed interests in astronomy. Everyone should have studied astronomy in schools. As we grow up due to family and social commitments we don't have time to hobbies like astronomy. Even in schools and colleges astronomy is taught in theory only. In India majority of schools and colleges lack lab facilities like Planetarium, Telescopes and binoculars to give the students a practical knowledge. Astronomy is an excellent hobby and useful time pass.Even with naked eye (unaided) you can see thousands of stars on a clear night. With your eyes you can see planets like Jupiter, Venus and Mars.With binoculars you can see planets like Saturn. With binoculars and Telescopes you can see star clusters, nebula, supernova, comets, asteroids and many more celestial wonders. Internet is a great help for amateur astronomers. There are lot of articles, news and guides for amateur astronomers on internet. There are free software programs that help you locate stars, planets and other deep space objects in real time. Even you can track man made satellites using the software. A good freeware planetarium software is 'stellarium'. It is freely available under General Public License(GPL). 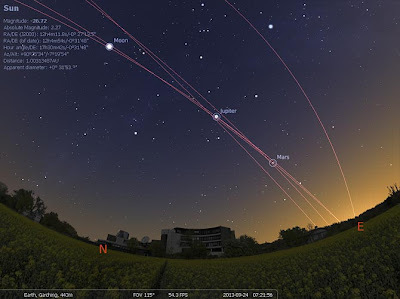 Visit www.stellarium.org/ to download the software for windows. I have just started to peep into the sky. I am trying to identify stars and constellations. This month Jupiter and Venus is seen on the western horizon. You can see it with bare eyes. If anyone interested in amateur astronomy in Coimbatore don't hesitate to contact me.